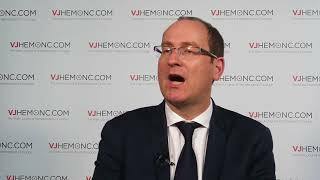 EBMT 2017 | Why has the biobank project been a success and what is the future for it? Regis Peffault de Latour, MD, PhD of Saint Louis Hospital, Paris, France, talks about the exciting aspects of the biobank project and why it is becoming a success at the 2017 annual meeting of the European Society for Blood and Marrow Transplantation (EBMT) in Marseille, France. He explains that the success of this project is due to the way that everyone, including physicians and researchers are working together to try to improve post-transplantation outcomes. There are currently some very exciting studies going on, mainly in graft versus host disease, biomarkers, and predictors for toxicity. Dr. de Latour explains that it is hoped that very shortly they will also be able to assist with other post transplant complications. Further working on the samples will mean an improvement in the understanding of transplantation and improvement for the care of the patients.